Nikon needed to redesign and rebuild a technology platform and user interface that would allow educational and inspirational branded content to be efficiently created, managed, repurposed, optimized and published. 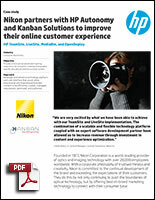 By partnering with HP Autonomy and Kanban, they were able to provide a more personalized and inspiring experience for consumers. This asset is sponsored by HP.